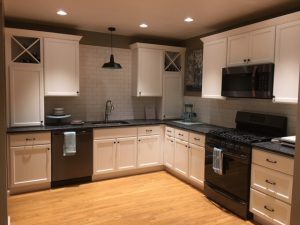 Get A Big Rustic, Coastal Look in This Affordable Priced Kitchen - Wood Palace Kitchens, Inc.
Timeless white maple cabinetry, leather textured granite counters and plenty of storage makes this affordable priced kitchen look anything but affordable. One of the 5 new designs in the Wood Palace Kitchen’s Showroom, this beautiful rustic coastal kitchen is proof positive that you can get the look you want in an affordable priced kitchen. The secret? Working with a kitchen design company that listens to what you want and helps translate your ideas into a design you can afford that doesn’t skimp on quality, details and high end finishes. Take these countertops as an example. Steel grey granite that has been finished with a leather finish, giving it texture and the look of expensive soapstone. Choosing a complimentary grey grout for the tile helps coordinate the tile into the design and gives dimension to the subway tile backsplash. Cool blue accents in the rustic light, dishes and accessories add an accent color that pulls it all together. The cabinets are from one of our most affordable cabinet lines, but they are made from maple, a popular and durable hardwood. The Plymouth style cabinet door is simple, clean and will never go out of style. Even on a budget, you can incorporate finished elements like the crown molding, and “X” cabinets that add interest to the look. Stop by our showroom and look at our displays and see how you can get inspired to remodel your kitchen even if you are on a budget. Come home to a Wood Palace Kitchen. This entry was posted in Kitchen Remodeling and tagged cabinets, countertop, design, kitchen, kitchen design, professional kitchen designer on June 23, 2018 by wpalace.